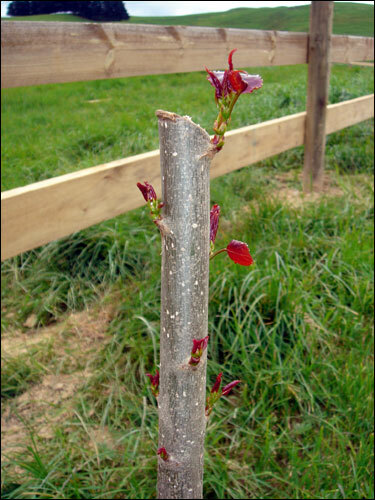 The poplar poles we planted a few weeks back have started to sprout. It was a bit of a leap of faith to hammer a stick into the ground, hoping it would turn into a tree but sure enough, sprout they did. The poles extend about 70cm above ground level so this new growth is out of the reach of our local hares. Where did you get your poplar poles from? We need about 100 for our 100m Southern Boundary, cheers. Hey Russell, we got ours from the Akura Conservation Centre in Masterton. The Greater Wellington council provides bulk trees at good prices to encourage planting. Your regional council might have a similar scheme in place. « The Comfrey is Sprouting!